20 year old Kylie Jenner is now the biggest earner on Instagram. In short, her Instagram posts are worth one million dollars of traditional ad spend based on her engagement rates and combined social media following of over 154 million. That number includes Snapchat, where Jenner held the crown for most followers in 2016. The company has also said that Jenner’s is now “the highest-valued influencer currently on social media today”, a role that was previously filled by Beyoncé. According to People, Jenner's posts on social media have generated a whopping 186,152,410 engagements over the past 30 days. “Kylie is an undeniable global brand, which may make some roll their eyes,” D’Marie Analytics’ CEO, Frank Spadafora, said in a press release. 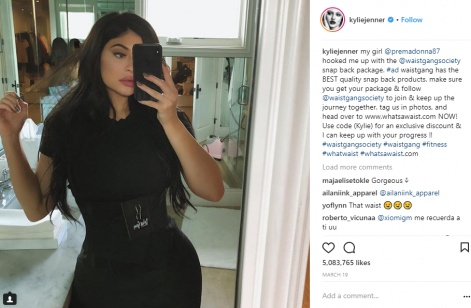 “Influencer valuations move up and down like the stock market, but Kylie is methodical about consistently generating aspirational content for her social audience, without jeopardizing authenticity,” Spadafora added. Get the latest news, interviews and in-depth analysis on Twitter and Facebook. Danielle Partis is Editor of InfluencerUpdate.biz. She was previously the lead content creator for TeamRock Games, as well as contributing to outlets such as Metal Hammer, both online and in-print. Prior to that, Danielle worked as a freelance PR consultant and freelance journalist for a number of outlets.